Organized as part of CCA’s special project, the Action Together in Combating HIV and AIDS in Asia (ATCHAA), the consultation brought together representatives of twenty Buddhist, Christian, Hindu, and Muslim religions as well as from Confucianism. They discussed the role of faith-based institutions and organizations in responding to HIV and AIDS epidemic in the country. 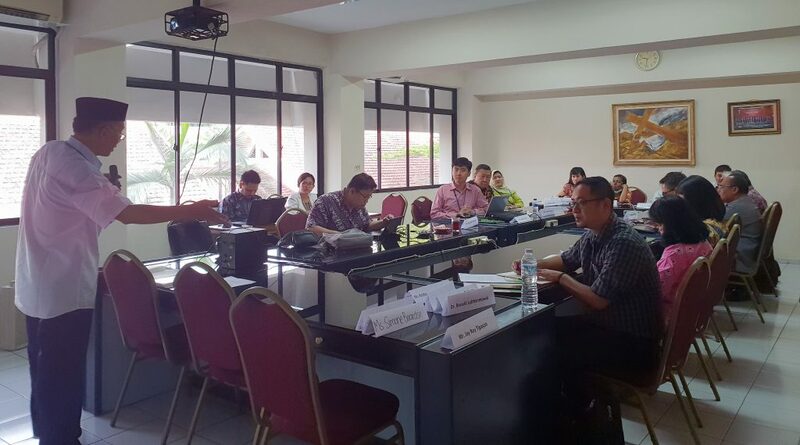 The consultation was held at the Jakarta Theological Seminary in Indonesia from 18 to 22 November 2018. The interfaith worship services throughout the consultation recognized religious and cultural expressions of different religions and sought the guidance of the Divine for a productive and a relevant way forward in combating HIV and AIDS in Indonesia. UNAIDS country director, Tina Boonto presented the current HIV and AIDS situation in Asia and the Pacific highlighting the challenges of Indonesia. While expressing appreciation in organizing a relevant, and timely interfaith consultation in Indonesia, Ms. Boonto said, even though the case of HIV is decreasing in Indonesia, there is increasing stigma and discrimination due to restrictive and restraining laws. Speaking on the Buddhist perspective on addressing the problems of HIV and AIDS, Venerable Suhadi Sendjaja, Chairman of Parisadha Buddha Dharma Niciren Syosyu said suffering such as HIV and AIDS is due to negative energies, which should be erased. The Islamic perspective was presented by Agus Salim Chamidi from Institute Agama Islam Nahdlatul Ulama (IAINU). “Islamic teachings view HIV from the perspectives of three concepts; humanity, rehabilitation and prevention”, and Slim Chamidi added that based on these concepts “there is need to reach out to people, collaborate with other religions and academic institutions, make empowered groups and support communities as well as to initiate combating HIV / AIDS”. Dr. Nur Arif from Natul Ulama added that the spread of HIV /AIDS should be approached both as a faith and cultural issue from an Islamic perspective. “In a cultural approach, we need to start living with them, and assist them in developing strategies to address the issue”, said Dr. Nur Anif. Mr.Ida Bagus Sutakertya of Ketua Parisadha Hindu Dharma Indonesia presented Hindu religious perspective to combat HIV and AIDS. He shared information on how Hindus in Papua are collaborating with other faiths in order to combat the spread of the epidemic. Dr. Erwiani Sutono from the MATAKIN of the Supreme Council of Confucians in Indonesia emphasized the value of family relationships and achieving harmony. Confucianists respond to the epidemic by holistic approach to human life. Speaking on the Christian perspective Dr. Alphinus Kambodji emphasized that we need to use the scripture and revisit the text to understand the impact of the problem of HIV and AIDS menace contextually. During the deliberations, the representative group of Indonesia’s religions observed that “faith-based organizations (FBOs) have played important roles in health and healing ministries in developing countries. In Asia and the Pacific, faith, and religion play important roles in the lives of the people. FBOs not only provide spiritual guidance to their followers, but they are often the primary providers of a variety of health and social services. Faith-based organizations and institutions rooted in communities build mutual trust, and they have the ability to influence the attitude and behaviour of fellow believers. In some traditional communities, religious leaders are often more influential than local government officials or secular community leaders”. The participants discussed on various challenges and key issues of HIV and AIDS in relation to their own faith, and they highlighted the need to use the faith platform to bring awareness, to prevent HIV, to provide necessary care and support, and advocate within faiths and governments. The participants agreed to revisit their scriptures in the context of HIV and re-affirms theology of compassion and inclusiveness.